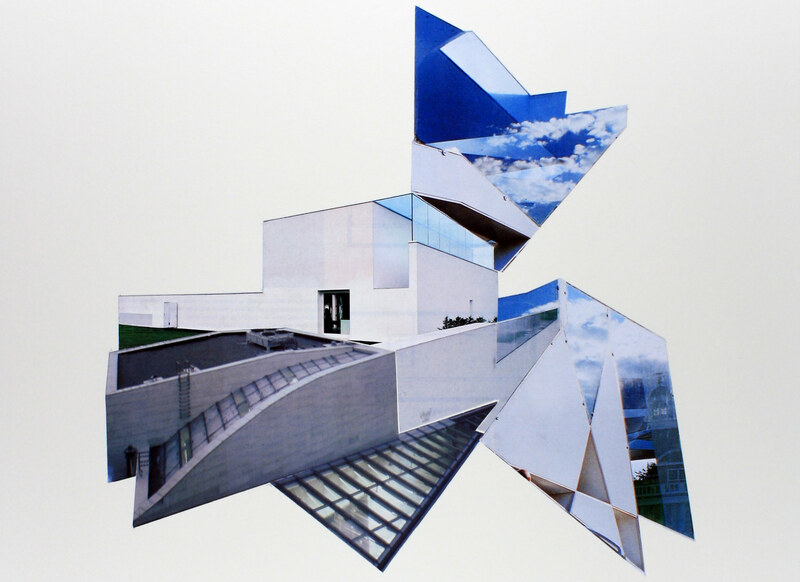 Hosted at Chicago’s Western Exhibitions, Chimera is a presentation of the architectural photomontages by Chicago-based architect Marshall Brown. Using a technique Brown refers to as “stealth collage,” images of buildings are cut and pasted into diverse, incompatible alignments. The specific pieces on display were created in 2014 as a set of 100 14- by 17-inch compositions. Chimera is the second solo show for Marshall Brown at Western Exhibitions. Marshall Brown is a practicing architect and an associate professor at the Illinois Institute of Technology College of Architecture. His practice, Marshall Brown Projects, has work currently on exhibit as part of the United States Pavilion at the 15th Venice Architecture Biennale. Chimera: The Work of Marshall Brown was on show at Western Exhibitions, 845 West Washington Boulevard, 2nd Floor, Chicago, IL, through June 25. 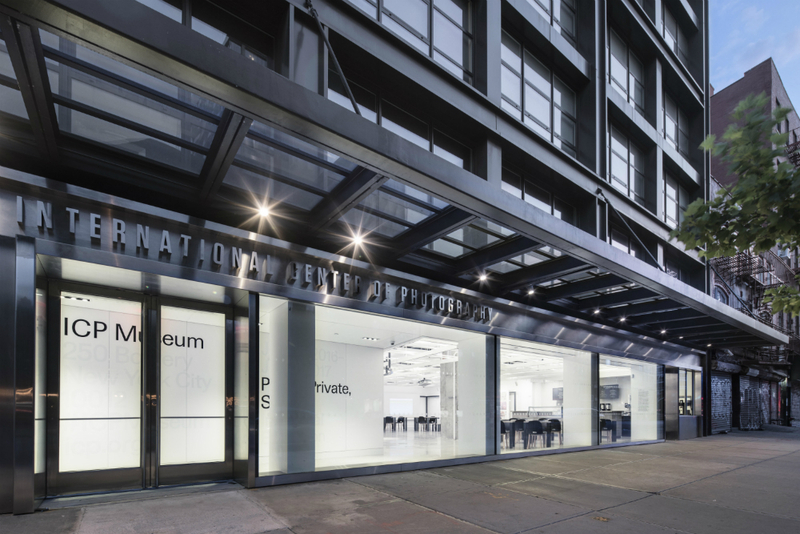 The Spear in the Stone at Simon Preston Gallery brings together two works by Amie Siegel: Fetish (2016) and Double Negative (2015). 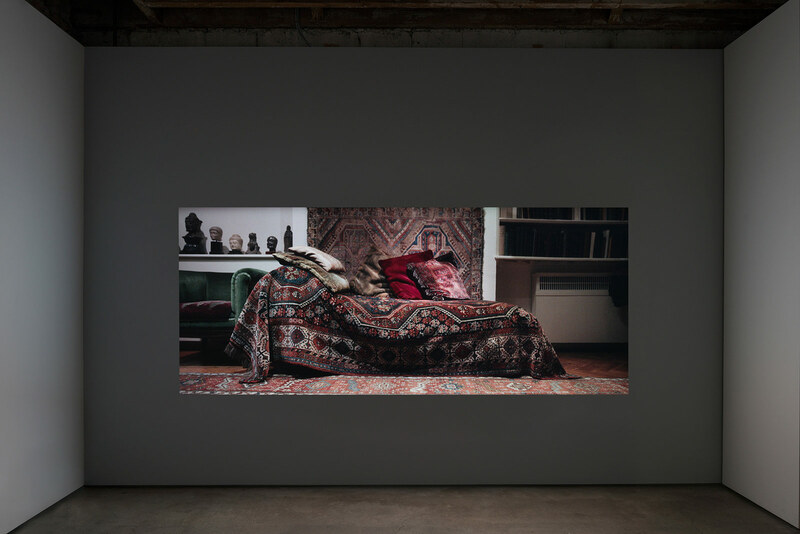 Siegel, who made the film The Architects for the U.S. Pavilion at the Venice Architecture Biennial in 2014, has taken architecture as the subject of some of her works such as Provenance (2013) and Quarry (2015). Similar to these earlier works, architecture in The Spear in the Stone becomes the entry point to an aesthetic inquiry about the animism of objects and the means by which they attain value. One enters the gallery facing a photograph of the French coast. The photograph resembles an intaglio print and sets the tone for the exhibition, which oscillates between different mediums of film and photography. This variety highlights various aspects of what one might call our contemporary fetishes and how they become apparent in the institutional acts of documentation, preservation, and even cleaning. The first part of Double Negative is an installation consisting of two silent black and white 16 mm films that depict the Villa Savoye and its black replica, the building for the Australian Institute for Aboriginal and Torres Strait Islander Studies in Canberra, Australia, designed by the firm Ashton Raggatt McDougall. In the gallery space, the projector occupies the center of the room and the two films are projected diagonally across from each other. The two films, initially made on 16 mm stock, are printed on 16 mm stock as negative images. This transfer from positive to negative leads to an abstraction of information and as details become less prominent, the two buildings resemble each other more. As the film itself is exposed to the air, dust, and humidity in the gallery, it presumably becomes scratched and loses more definition every time it loops. 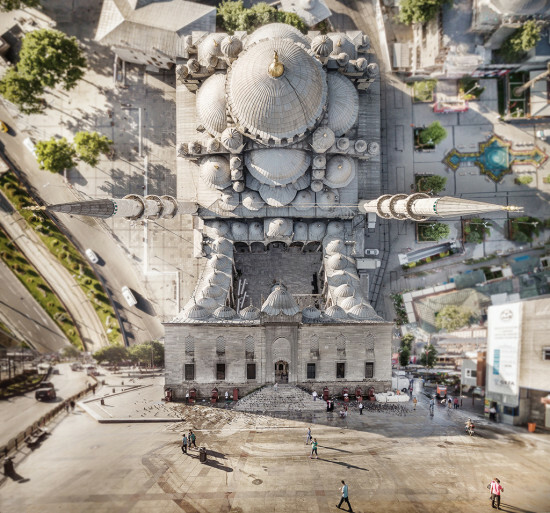 The negative print reverses the colors of the buildings. 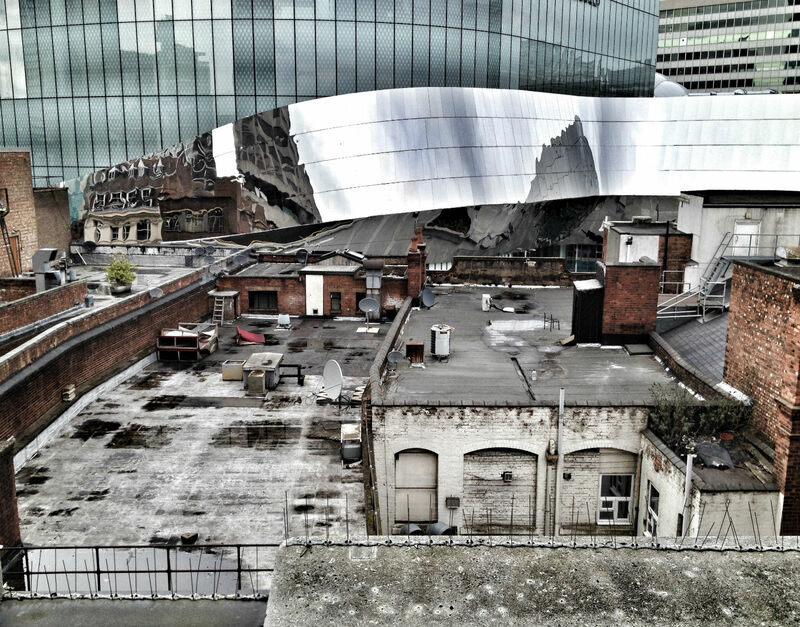 The reversal is further reflected in the environments of the two buildings. The opening scenes of both films display swans, one black (native to Australia) and one white, which are mirrored but at the same time reversed in color. Through these reflections and reversals, and through the loss of definition in the medium, the two buildings become equivalent, no longer one original and the other a copy, but negatives of each other. In The Miracle of Analogy: or the History of Photography, Kaja Silverman writes that the photographic medium did not necessarily develop out of a desire for reproduction and dissemination of sameness, but out of analogy and a desire to make traces and connections by means of images. When located in analog photography, the two buildings open up a conversation that slightly distorts the dominant story of Villa Savoye becoming a sign of Western modernism and being replicated for an institution dedicated to study of "other" cultures. Instead, by treating the two buildings as equivalents, the installation speaks of a fascination with architecture that raises the question: Why this fascination in the first place and why exactly is this architecture seductive? 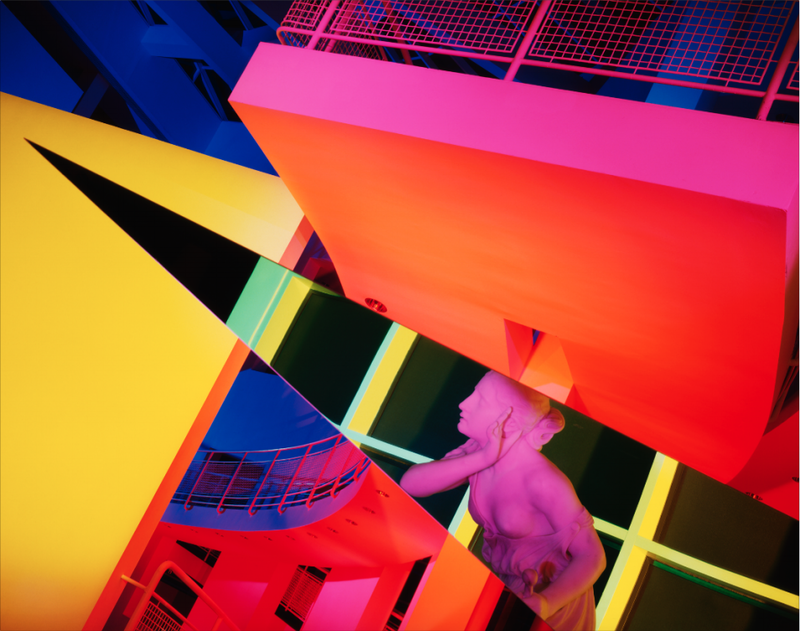 The second part of Double Negative is a color HD video that takes the viewers from the shores of France to the interiors of Villa Savoye and then from the beaches of Australia to inside the Institute, where archival material is being duplicated into digital copies. Here, the film focuses on the material that makes up the archives of the institution and also on the machines and devices that are meticulously recording and duplicating these items into a digital format. As we see a culture disappearing and being preserved by ethnography, we also see former technologies and mediums disappearing and now being preserved by newer ones. The two kinds obsolescence, cultural and technological, follow one another. Which one is more valuable, the actual object and its story in a given culture, or the ethnographic practice that tries to document and make sense of these? Fetish, in its ethnographic definition, is a "material thing with intense spiritual power." The "material thing" is as much a stone as it is the video of an ethnographic field trip that is being digitally duplicated and the "spiritual power" relates as much to a disappearing culture as to the foundations of ethnography as a discipline with its documents, archives, and methods. The meticulous duplication—the attempt to protect and preserve every bit and piece of information that is in the collection—directly contrasts the method by which information is lost in the first part of Double Negative. The hygienic environment of the institute also contrasts with the gallery where the 16 mm film is exposed to air. The next space in the gallery contains Fetish, another HD video formatted as CinemaScope, showing the yearly cleaning of Freud's collection of archeological artifacts at the London Freud Museum. Freud, one of the top theorists of fetish in the modern world, was an avid collector of small archaeological statues, which were displayed on his desk and shelves in his office. In Fetish, lights go on, the camera shoots the different parts of the Freud's office and focuses on the cleaning activity. The CinemaScope format allows tracking shots throughout the video, showing the objects on Freud's desk and shelves. While the tangibility of the objects is captured in the acts of cleaning and the sounds of brushes touching the objects, the visual environment of the CinemaScope hinder the touch. A contemporary version of fetish emerges between the objects and their images. The title The Spear in the Stone comes from an ethnographic video recording found at the Australian Institute for Aboriginal and Torres Strait Islander Studies. Parts of original recordings can be seen in Double Negative as they are being digitally transferred. With these two works, the exhibition raises the questions: What is our spear in the stone; what are our myths and fetishes; what instills animism in our objects? And furthermore, what is the role of architecture? In this exhibition, architecture is where the seduction begins as an entry point to the object world. A material and spatial practice that is at the same time a sign of cultural predilections and preferences, architecture can also be imagined as the beginning of stories that animate our world of objects. After triumphantly declaring "The hand is back” at this year’s Venice Biennale, Swiss architect Peter Zumthor touched off a debate within the architectural community regarding an age-old divide that echoes back through the annals of the architectural profession, pitting the handmade against and the technologically-derived. And while today’s quarrels over parametricism and auto-construction have found new kindling, let’s remember that, with roots in the Industrial Revolution, these disagreements have been smoldering for generations. The work of brothers Charles Sumner Greene and Henry Mather Greene in Southern California produced unambiguously handmade works within the American context of the early 1900s. Their buildings, the majestic Gamble House and the lavish Blacker House, for example, were over-wrought odes to bespoke craftsmanship that would not be out of place in today’s hipster bazaars. Built amid the bucolic environs of freshly conquered territories, the Craftsman-style Greene and Greene espoused not only represented a powerful counter to mass production, but utilized the a fluid vocabulary of vernacular Asian influences for inspiration. More specifically, Greene and Greene’s designs worked hard to profess this return to artisanship by drawing heavily from the traditional wooden architecture of Japan. 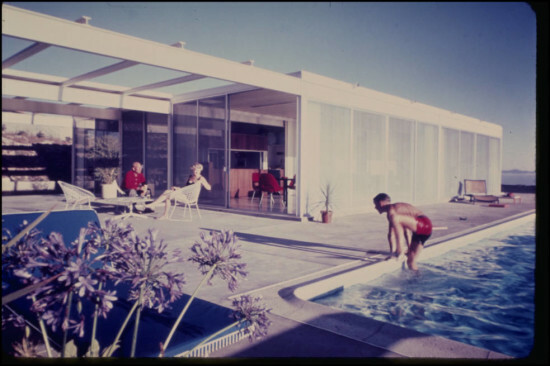 The Huntington Library, by showcasing the work of Japanese-American photographer Yasuhiro Ishimoto’s photographs of Greens and Greene's Pasadena architecture, aims to bring the Greene Brothers’ cultural appropriation full circle by examining the influence of American cultural appropriation from the Japanese point of view. Ishimoto, a man born in San Francisco, California but raised in Japan, became a renowned photographer after spending World War Two in an internment camp in Colorado. 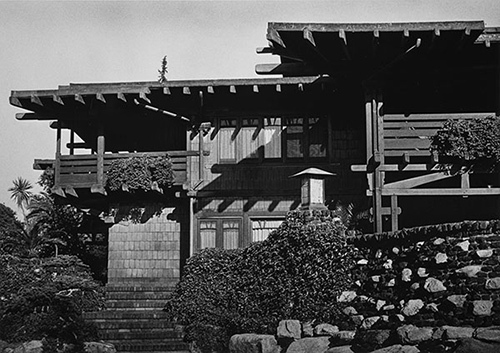 His photographic interests eventually took Ishimoto back to Japan, but he returned to America in 1974 to photograph Greene and Greene’s craftsman houses for a Japanese design magazine. Though Ishimoto's other works have been exhibited in the United States since the 1950s, this show marks the first time his Greene and Greene photographs are being exhibited in America. The 46 black-and-white photographs that resulted focus intently on the literal nuts and bolts of Greene and Greene’s designs; their wooden tectonics and sumptuous finishes are subjects of intense focus and composition. Former curator of the Gamble House Anne Mallek said in a press release for the exhibition, “Ishimoto rarely made an image of a structure in its entirety, but chose rather to examine details and create abstractions, focusing on pattern, light, and structure. All of the images telegraph his sensitivity to material, texture, form, and light.” The exhibition, “Yasuhiro Ishimoto: Bilingual Photography and the Architecture of Greene & Greene,” coincides with the reopening of the Huntington Library’s recently-renovated, Greene and Greene furniture repository that houses period rooms from the Gamble House, and is on view until October 13 2016. However, as one photographer has pointed out, much still goes unnoticed. 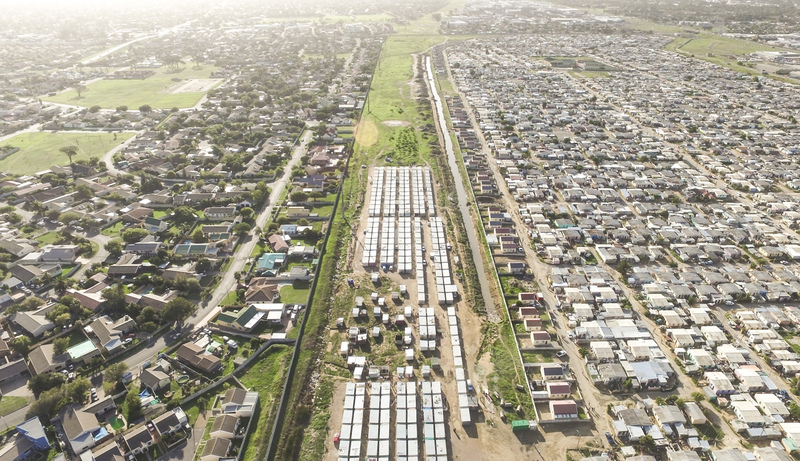 A resident of Cape Town, South Africa since 2012, Johnny Miller has captured the city’s housing landscape and highlighted a problem that's still plaguing post-Apartheid South Africa. 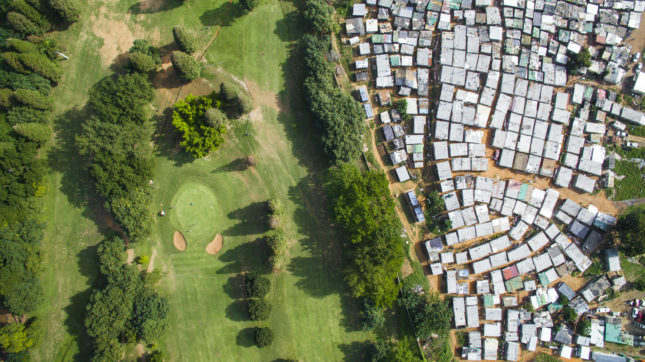 As his project title Unequal Scenes suggests, Miller’s images portray the scale and proximity of inequality still present in Cape Town. 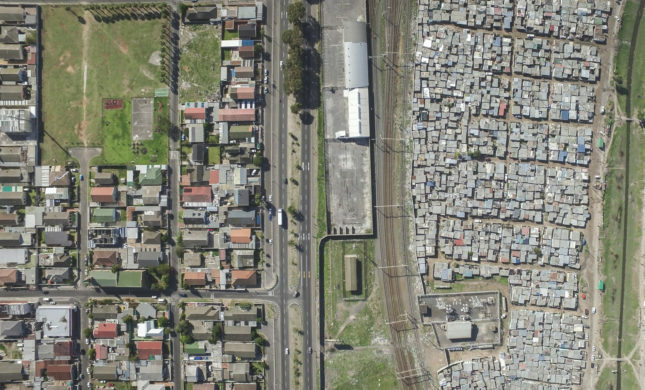 "There's a very uniquely South African form of spatial segregation that was developed during the apartheid," said Miller in an interview with The Architect's Newspaper (AN), adding how city planning and infrastructure carved Cape Town's social and racial demographics. "So, for example, roads, rivers, train tracks: the apartheid government did very well at separating people through architecture," he continued. 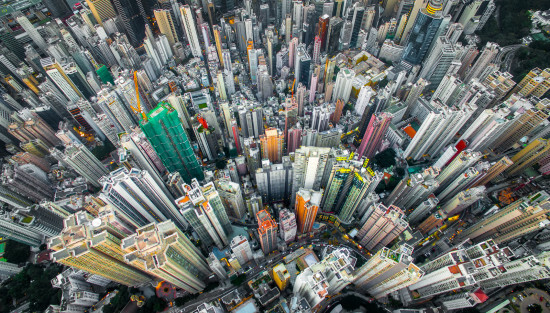 "You see just in the way that the city is designed, it’s going be pretty difficult to redistribute wealth and facilitate the free movement of people." Miller said he likes how his detailed images facilitate long-term viewing. The physical structure of communities becomes visible, allowing the disparity to be instantly apparent. The homes of the wealthy are arranged in a clearly structured and planned fashion. The "townships" of the poorer, black community however, show roads—if they can be called that—meandering in every which way. As a result, keeping track of dwellings, keeping them on the electric grid and part of the plumbing system, is difficult though most visibly, however, is perhaps the change in color from one side to the other. For instance, one township is adjacent to a golf course: a wealth of greenery covers the wealthier area while the township shows only shack rooftops and dusty dirt-tracks. With the rise of the Nelson Mandela, the apartheid government lost power in 1994. More than twenty years on, Miller explains that change hasn't been easy. There's been a failure in communication between the government and its people, leading to mistrust in state power. "There’s a lot of inequality, disenfranchised people who are really angry," said Miller. But he's is hopeful his project will finally spark a constructive dialogue between the authorities and the population. “I’m trying to promote a peaceful dialogue where people can share their opinions and become aware…. I think awareness is the only tool to defeat the fear that I see as really the root problem,” he added. Miller hopes the legacy of his project will be the government's response to the questions that arise from his photography. Already, government officials have responded to his work, remarking on their awareness of the issue and stating that they are working on the problem. "What gets me excited about this project... you start to hear those answers, which is really what people want to hear," Miller implored. In light of the responses Miller’s work has drawn, especially in comments on his Facebook page, it seems that his photography illuminates what appears to be an inconvenient truth for many. “In my opinion, I think it’s a lot of fear that drives these negative comments. Fear of the other, not understanding the person on the other side of the fence." “Perhaps it takes flying above people, two to three hundred meters, to take away that humanity and reduce humans to mass clearings, or agglomerations, for people to pay attention," he continued, noting how some may have become desensitized to the traditional imagery of poverty: the African child with a bloated stomach looking into the camera. Indeed, "that face" can come from anywhere in the Third World, whereas Miller's drone images illustrate that poverty literally is on their doorstep, something which is arguably more personal. What is apparent from Miller's work is that the drone provides a new perspective that, in Miller's words, “people really respond to. Seeing something they thought they knew in a different way" is evidently something that resonates—with the wealthier side for now, at least. If you want to follow Johnny Miller's project, you can do so through his Twitter feed, here. You can also find more videos here. Braving temperatures as low as -22°F, Iwan Baan is no stranger to shooting in the extreme. Armed with his camera, tripod, and Canada Goose Parka, the esteemed Dutch architectural photographer has produced a series on Beijing-based MAD Architects' Harbin Opera House in China's Northernmost province. 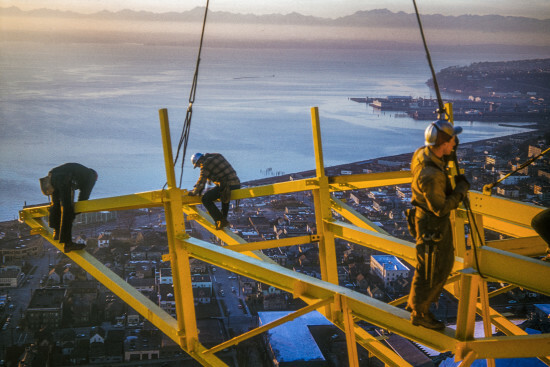 His work, unlike most in the industry focuses on people, not buildings. "My pictures are always very much about the users of the place," Baan says in a film covering the shoot. "I'm not trying to create timeless images which could be in any moment in time. They always should very much have a connection to a specific place, time, people, a context, a culture and this kind of thing." "So people are, in that sense, a very important part," he explains. However, despite the alternative choice of focus, his work still conveys the fluid curvature of MAD's Harbin Opera House. Cast against a snow-white sky, the meandering white aluminum panels can be seen elegantly rising from the snow. In this medium, the building's intentions of emulating the sinuous nature of its marshy surroundings and adjacent frozen riverbank are well and truly achieved. Even among fading light, the opera house's relationship with the site remains intact through Baan's lens from both interior and exterior perspectives. 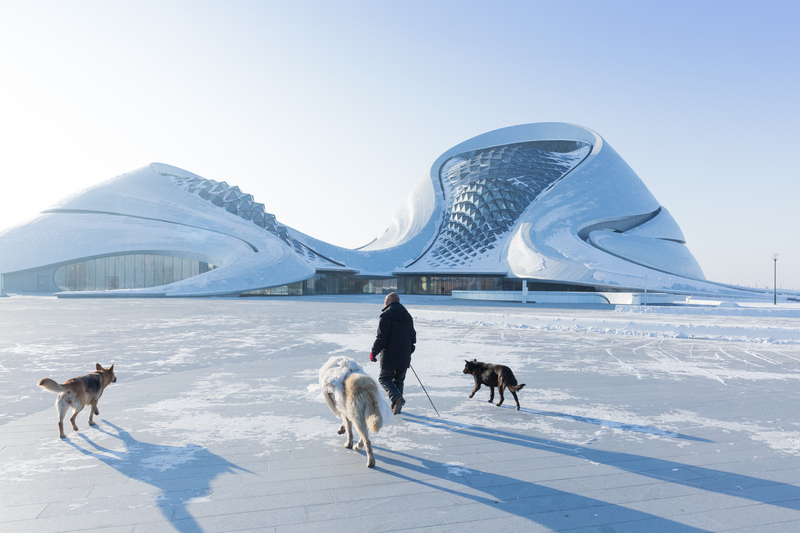 “Harbin is very cold for the most of the year, so I envisioned a building that would blend into the winter landscape as a white snow dune arising from the wetlands,” says Ma Yansong, principal architect and founder of MAD Architects. “Opera design normally focuses on internal space, but here we had to treat the building as part of its natural environment—one outside the urban context,” Yansong adds. Traditionally, opera house photography evokes silent spaces, that, by contrast are designed to be anything but. Here, the acoustic properties of the space embedded within the theatrical grandeur are enhanced. With his uncanny habit of seeing things differently, Baan however, captures crowds on their feet in rapturous applause. Outside he shoots tourists, dog walkers, and local ice fishers setting an enlivened scene. Purist's needn't worry though, as shots without any intrusive people also feature. In related news, MAD has released a video showcasing their Invisible Border Installation for the Interni's Open Borders exhibition at the 2016 Milan Design Week. A descending veil, comprised of translucent polymer strips can be seen fluttering in the wind as it is loosely held in an undulating form, suspended from the Loggia of the Cortile d’Onore.